Here you will find information about website development on the Blogger website platform to include content and updates to promote your business online. 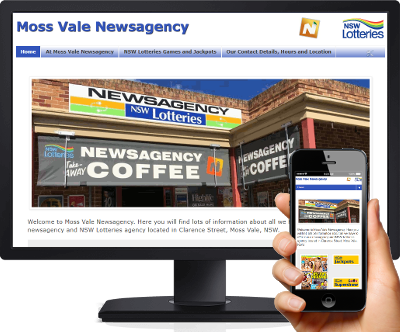 For more information about the Newsagents Blogger Website and Updates or to discuss your website needs free call 1800 902 900 or click here to contact us. To see how your Blogger website can be developed to promote your business, take a look the examples below for Bulahdelah Post Office, Moss Vale Newsagency and Nextra Leongatha. To view the mobile version of the website simply visit the site on a mobile phone or tablet. Website development and updates are designed to meet the individual needs of each newsagent. This involves adding content to your website to promote the complete range of products and services your newsagency offers. The website content is developed for you following your response to a simple checklist about the products and services you offer. To ensure your website is always kept up to date a regular website updates service is provided through your subscription to Newsagents New-Web-Updates. upon completion your Newsagents New-Web-Updates subscription will ensure your website always looks current and is kept up to date. other updates as required to keep your website up to date and to assist with your promotions. Your subscription to Newsagents New-Web-Updates ensures your website always looks up to date. The website content development will commence upon receipt of both your development checklist and your initial payment. The website content will be added to your website within the following four weeks. Your Newsagents New-Web-Updates Subscription will commence within four weeks of your initial payment for the website content development. Your website content will be developed using your website content development checklist as a guide, further input into the website content may be made at any time. For more information about the Newsagents Blogger Website and Updates or to discuss your website needs please call us on free call 1800 902 900 or click here to contact us. * The services provided are limited to those possible within the content management system of Blogger. Services are provided on the basis of sharing the available resources across the subscription membership. Where requests for services are considered to be above what is �fair� we will discuss this with you along with options for alternative arrangements to meet your needs.